For more on Dixie Belle Paint, visit dixiebellepaint.com. Dixie Belle Paint sells their Chalk Mineral Paint on their website, but their product is also sold in 1,500 retail stores nationwide. 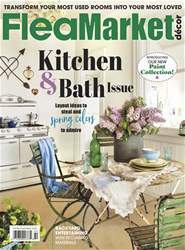 The Flea Market Décor paint line will be available this spring, and we’ll announce a date closer to the release. For more on Christina, visit vintagefourfifty.com or follow her on Instagram @vintagefourfifty. Christina also sells her signs on Amazon and in her Etsy shop. Visit etsy.com/shop/vintagefourfifty.